Wrexham boss Gary Mills says he has made his mind up over Andy Bishop's future but will announce his decision once the striker returns from holiday. Bishop, 32, is one of a number of high profile out-of-contract players. The former Bury player scored 15 goals this season and is due back next week to learn his fate. "I have [made my mind up] but out of respect they'll be no clues from me which way that's going to be," Mills said. "But when he gets back he's going to be the first to know." Mills, who left Gateshead to take charge of Wrexham, has also warned his squad that he will do things his way, and that if anyone does not like his methods they are welcome to leave. Former manager Kevin Wilkin's training methods were criticised by some players following his departure in March, but Mills will not tolerate problems being leaked outside of the club. "I'm the manager and it's my dressing room," the former Nottingham Forest player added. "There's going to be no player that will dictate what that dressing room is going to be and what happens on the training field. "It's my job to dictate, it's my job to motivate, it's my job to make sure we're organised and however I do that the players will just have to get on with it. "If a player doesn't want to get on with that, if a player doesn't want to be part of that, he knocks on my door and tells me. "He doesn't tell all and sundry about it, he doesn't make it common knowledge. "Some players don't like it because maybe they're not playing how they'd like to play, maybe it's not happening for them and they look for excuses. "I don't think anybody achieves anything by letting certain people know that things aren't right in their eyes." Captain Dean Keates and defender Neil Ashton have not been offered new deals but Mills wants midfielder Jay Harris to stay. Mills, though, has denied dressing-room unrest was behind the departures of Keates and Ashton: "Absolutely not, because if that was the case then I'd be wasting my time now, I'd admit defeat now. "Believe me it wasn't an easy decision on either of them; Neil a little bit more because I wanted Sean [Newton], Dean not so much because at the moment I haven't replaced him. "But they needed an answer, they've got to move on and carry on with their careers." Mills is also hoping to confirm the appointment of Darren Caskey as his assistant manager in the next 24 hours. The former Tottenham midfielder was his number two at Gateshead. 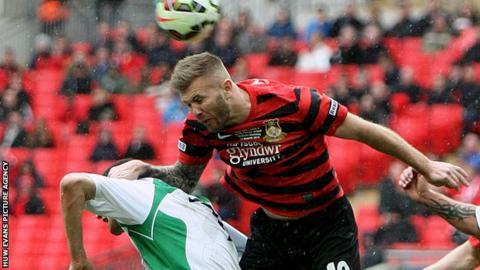 Wrexham have also released midfielder Elliott Durrell, 25, who joined the club from Hednesford Town in January 2014.